Mini Pigs in a blanket are my addiction! This party appetizer snack keeps kids and adults alike happy. 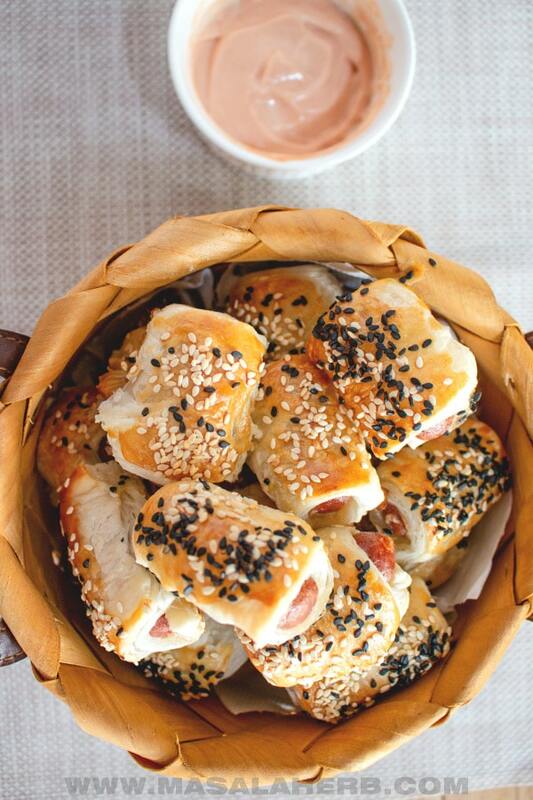 My easy pigs in a blanket are prepared within minutes and look great with sesame. Watch the quick video below to make your own cocktail wieners wrapped in crescent rolls. What are pigs in a blanket? Pigs in a blanket are Wiener Frank Sausages wrapped in dough. These are then baked and usually enjoyed as a snack or party appetizer. Usually, puff pastry or crescent dough is used to wrap in the sausage. Some people prefer to use pizza dough. Mini Pigs in a blanket are made of mini franks, lil smokies. They are smaller in size and can be enjoyed in one bite with a pigs in a blanket dipping sauce such as a yum yum sauce. Often while, pigs in a blanket are associated with kids food. I beg to differ because as a millennial I will happily have my lil smokies in a blanket while on the PlayStation or on Netflix. 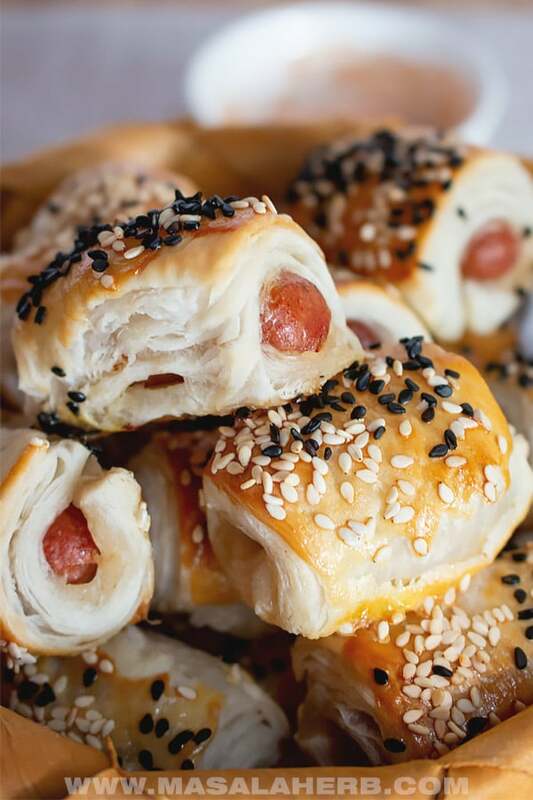 Pigs in a blanket are also known as pugs in a blanket, mini crescent dogs, cocktail wieners wrapped in crescent rolls, lil smokies in a blanket, crescent mini hot dogs and little smokies pigs in a blanket. Pigs in a blanket are a carnival specialty from the German region of Nordreihn-Westfalen. People would consume the pigs in a blanket during ash Wednesday. The pastry dough would hide the sausage inside so people would try to cheat the first lent fasting day by “sinning” with hidden hot dogs. I bet that’s how everyone kept quite whenever the church came up with another stricter lent season law! Keep calm and munch on your hidden sausages covered by a pastry blanket. 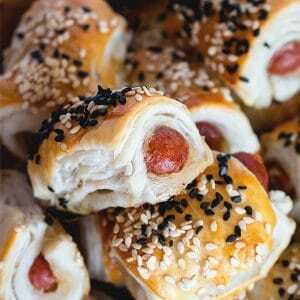 The son of the guy who invented the Wiener Sauage (aka Sausage form Vienna) made the pigs in a blanket popular in Vienna around 1900. Ironically these turned into hot dogs at some point. Next time you visit Vienna, go and grab a hot dog! Those are the best. 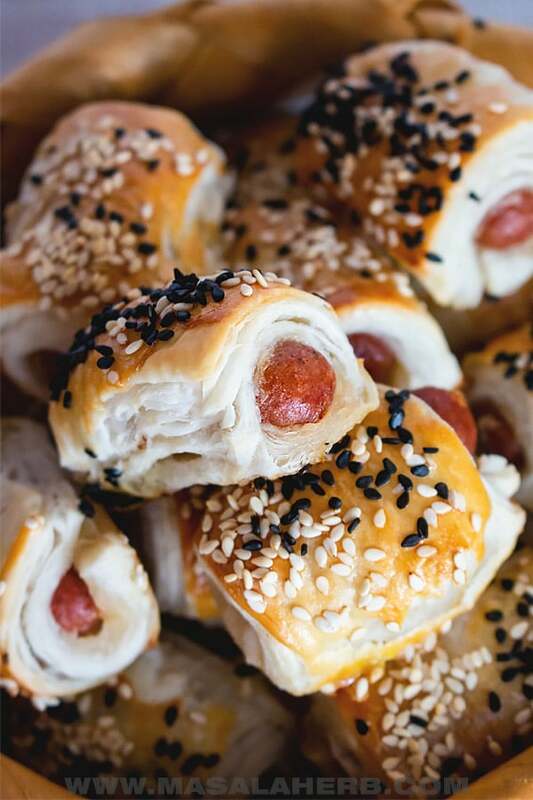 The American pigs in a blanket as we know picked up in popularity in the US and now thanks to Pinterest, the rest of the world is drooling, baking and cocktail wieners wrapped in crescent or puff pastry rolls. Why are pigs in a blanket called like that? The sausages are mostly wiener franks and made of pork (and maybe beef). Pigs in a blanket is a fun creative name. Someone really loved them so much that they saw little piglets wrapped under a blanket. It also indicated that these mini crescent dogs came from a German food tradition. Pigs, Sausages and puff pastry are a common appearance in central Europe. In fact, pigs are considered good luck. So, there might be a deeper connection there. Food traditions and history tend to get scrambled. Add the following to your pigs in a blanket before you roll them in and bake the piglets. 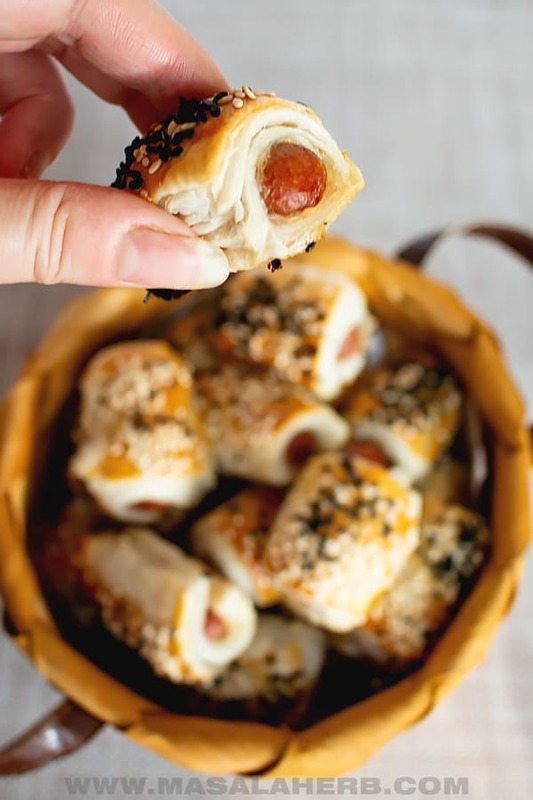 Mini Pigs in a blanket are some of my favorite party appetizers, Serve them up to your friends at a tailgating party or enjoy these tasty bites while watching the great super bowl game. Pick a dipping sauce and let's get going! Roll out your Pastry dough with some flour into a large rectangle. The dough should be about 1/8 of an inch thick or 3-4 mm. Make sure you have rolled out the dough evenly on all sides. 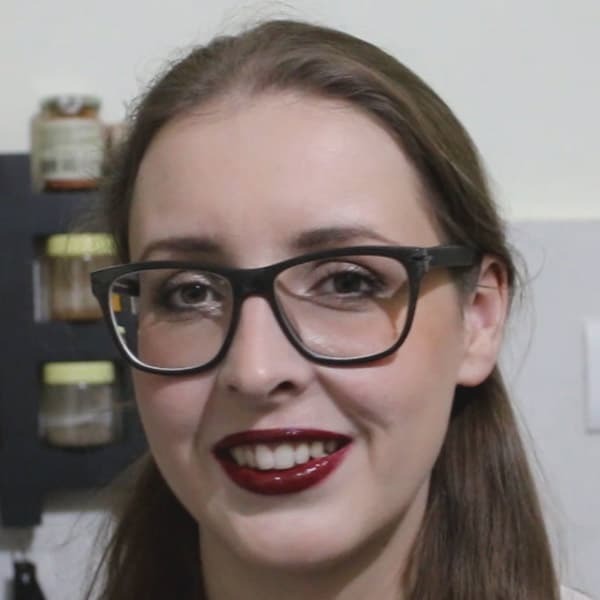 Preheat your oven to 350 Fahrenheit or 180 Celsius. Cut off the edges if uneven. Slice your dough lengthwise and crosswise to create squares (watch video). The squares should be the size of your sausage. Scramble the egg in a bowl. this will be your simple egg wash and you will use it to seal the edges as well so that the pastry doesn't open up during the baking process. Next, with a pastry brush, brush the egg wash on one side of each square. This is where you will seal it afterward. Place on each square a sausage. Take the pastry sausage bundle into your hand and wrap the pastry over the sausage. Seal it on the edge where the egg wash is. It will stick. Repeat the process to make mini pigs in a blanket. Prepare a baking sheet with parchment paper. Place all the pigs in a blanket next to each other with some distance because they will puff during the baking process. With your brush spread the egg wash over each sausage roll. Sprinkle sesame seeds over the pigs in a blanket. Bake for about 15-20 minutes, until puffed and golden brown. Let them cool a bit. Serve warm with a variety of dipping sauces. Use a roll of Puff Pastry or Crescent pastry, but you can also use pizza or pie dough. Just keep in mind that puff and crescent pastry will puff a lot, which I think is great. Use mini cocktail franks, mini wieners or lil smokies sausages. I like to use white and black sesame seeds because it looks better. Feel free to do it your way. Dear Reader, do you prepare pigs in a blanket for yourself or for the kids? You can get these small franks. These look amazing!! I would love to try them! Pinning. Hi, this may be interesting you: Mini Pigs in a Blanket!